That's it from us for this week. Thanks for joining us. We'll be back from 06:00 GMT on Monday, with all Kent's news, sport travel and weather. You can get in touch on Twitter , on Facebook or by sending us an email . We look forward to hearing from you. Take a brolly and a jumper out with you this weekend. Here's my latest forecast. After nearly four years of hard work, staff at Medway's hospital finally reap the reward. A hospital trust branded "inadequate" has been taken out of special measures after nearly four years. Medway NHS Foundation Trust has made "substantial improvements", the Care Quality Commission (CQC) said. Medway Maritime was one of 11 hospitals in England put into special measures following Sir Bruce Keogh's review of hospitals in July 2013. Previous inspections had highlighted concerns over patient safety, organisation and governance. Secretary of State for Health Jeremy Hunt said: "Their journey hasn't been an easy one - some of the problems at Medway were deeply entrenched - which makes the achievement all the greater." Chief inspector, Professor Sir Mike Richards, checked the trust over five days at the end of last year. In his inspection report, he said: "There is no doubt that substantial improvements have been made. The leadership team is now fully established and there is a strong sense of forward momentum." Medway Maritime Hospital has come out of special measures, after nearly four years. The Care Quality Commission says it still requires improvement, but has made great strides. M20 Kent eastbound severe accident, between J5 for A20 and J6 for A229. M20 Kent - One lane closed on M20 coastbound between J5, A20 (Aylesford) and J6, A229 (Chatham), because of an accident. The boss of the health trust which runs the Medway Maritime is delighted that the hospital has come out of special measures. 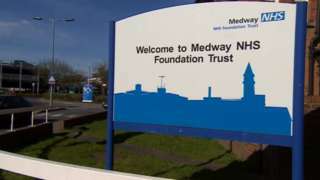 I was given exclusive access as Medway NHS Trust Chief Executive Lesley Dwyer told staff it was being taken out of special measures. Here's how the staff reacted. Councillor David Brake, Chairman of the Medway Health and Wellbeing Board, said he was pleased to hear "significant improvements have been made at Medway Maritime Hospital" and offered his congratulations to everyone involved. Quote Message: The community of Medway will be as pleased as I am to learn of this good news. Staff at Medway NHS Foundation Trust work hard to ensure patients receive the care they deserve and I hope we continue to see further improvements. The community of Medway will be as pleased as I am to learn of this good news. Staff at Medway NHS Foundation Trust work hard to ensure patients receive the care they deserve and I hope we continue to see further improvements. Having met with the leadership team at the hospital, I am aware of their determination to continue making steady progress to provide good quality care in Medway." The Conservative MP for Gillingham and Rainham, Rehman Chishti, has given his view on the news that Medway Maritime has come out of special measures. Medway Maritime was in special measures for 41 months. It was supposed to come out after 12 months. It was in special measures longer than any other hospital in England. So when the chief executive stood up in front of a packed staff canteen and said the words "out of special measures", yes there was a cheer, but there was also relief and even a few tears of joy. Four and a half thousand people work for the trust. One of their senior staff told me they have endured four years of being told they were no good at their jobs. Today's news changes all that. Yes, the Care Quality Commission (CQC) have some ongoing concerns. But when I first interviewed Lesley Dwyer almost two years ago she said she thought her biggest "difficulty" would be to engage the staff and to "reignite" a sense of belief in those staff. She would appear to have done that. The CQC highlighted the "commitments and hard work of the staff" in achieving this turnaround. Coming out of special measures will endorse the work already done and encourage the belief from the Chief Executive that the trust can continue its progress towards a "good" or even "outstanding" rating in the future. Drug driving arrests in Kent and Sussex have doubled in two years. Which South East building deserves an architecture award? Fourteen buildings, including the i360 viewing tower in Brighton, have been shortlisted for the Royal Institute of British Architects South East awards 2017. Other buildings nominated across the South East include Kingsdown House in The King's School in Canterbury, Command of the Oceans at Chatham's Historic Dockyard, Hastings Pier and Brighton College. The awards ceremony takes place on Thursday 25 May. A world-renowned Catholic college in Margate says new Home Office rules are forcing it to close. Ever wanted to run away and join a fun fair? Well now's your chance. Dreamland in Margate is holding a recruitment drive for summer staff this afternoon, between 13:00 GMT and 16:00 GMT. Bosses of the heritage theme park are looking for retail and customer services staff, ride operators, restaurant and bar staff and entertainers. The Health Secretary adds his congratulations to staff at the Medway Maritime hospital. Well the Spring-like weather couldn't go on for ever, could it? There's rain and wind on the way for the weekend. Here's my latest forecast. Medway Maritime Hospital was branded "inadequate" for nearly four years, longer than any other in England. The family and friends of a man found dead in a car park in Tunbridge Wells say they're shocked and devastated about what happened to him.